I have always admired Aparna‘s pictures and her stories. I normally never go further to read the recipe in most cases when I am admiring the pictures more. So when I clicked her menu, I was surprised at how well she had lined them up. I have always wanted to put a picture for all my index pages, but never came around doing that. Seeing her Index page, it surely makes me want to do it right away! I was excited seeing her Palakkad Cuisine. Kerala Cuisine is one of my favorite ones and especially after blogging I have come to know that even within that there are so many different styles. Then seeing that she has a good collection of baked goods, I remembered I have not yet got my muffin tray from Divya, who was sweet enough to get me one from her native. Hopefully I should get it within this month for me to attempt some baking from Aparna. By the way which reminds me that T&T is until September 15th and not end of this month as I wrongly mentioned. I wanted to choose something that I could carry for my lunch and I decided on Beans Molagutal as I remembered that beautiful picture from memory. 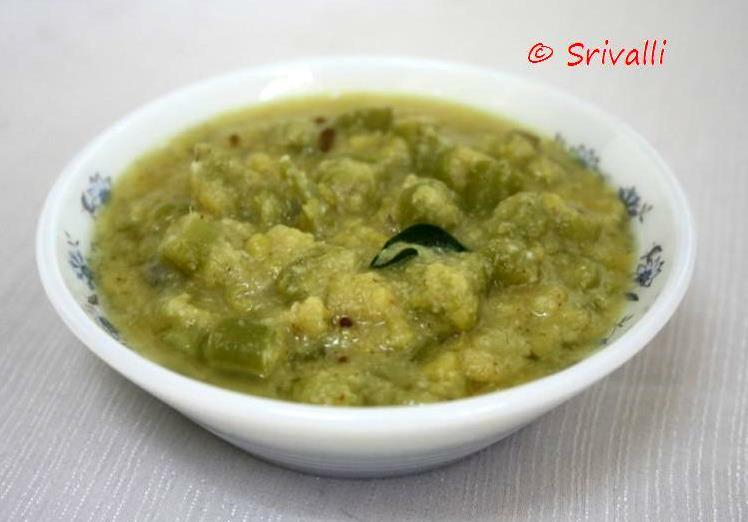 Aparna mentioned that this dish is bit bland so the parupu thogayal goes well as a combo. So made both the dishes for afternoon lunch. Since this is a lunch box Series, I had to hurriedly take a group photo. Requested Hubby dear to take individual pictures to highlight the dishes more. Normally Coconut oil is used here, but I used regular oil. Pressure cook toor dal for 4 whistles, once the pressure falls, remove and add finely chopped beans. Pressure again for another 2 whistles or till the dal is soft. Meanwhile in a pan heat oil, roast the urad dal. Add cumin seeds. Fry till they start crackling. Then once cooled grind along with green chilies and coconut to a smooth paste adding water. Once the pressure is off, add this paste and 1 cup water. Bring to boil. In the pan, heat oil add mustard and urad dal along with curry leaves. Then pour this over the boiling dal. Notes: Aparna added only 1 chili, while I added 2, still it wasn’t very spicy. I know this kootu is supposed to be a bit bland. So you can make this dal chutney and spice the meal. This one is made with Toor dal, Urad dal with Coconut. Since this is spicy Aparna says its a good combination with the bland mulagootal! I must agree with that for sure. It indeed was good. And my colleagues ate the chutney as such. Heat a pan with oil, roast toor dal, Urad dal well till they start turning golden. Add the chilies towards the end along with hing and curry leaves. Grind with coconut, tamarind and salt adding little water into a coarse paste. Serve this with mulagootal and rice. This thogayal will go well with plain dosa too. I really had a great lunch thanks to Aparna. 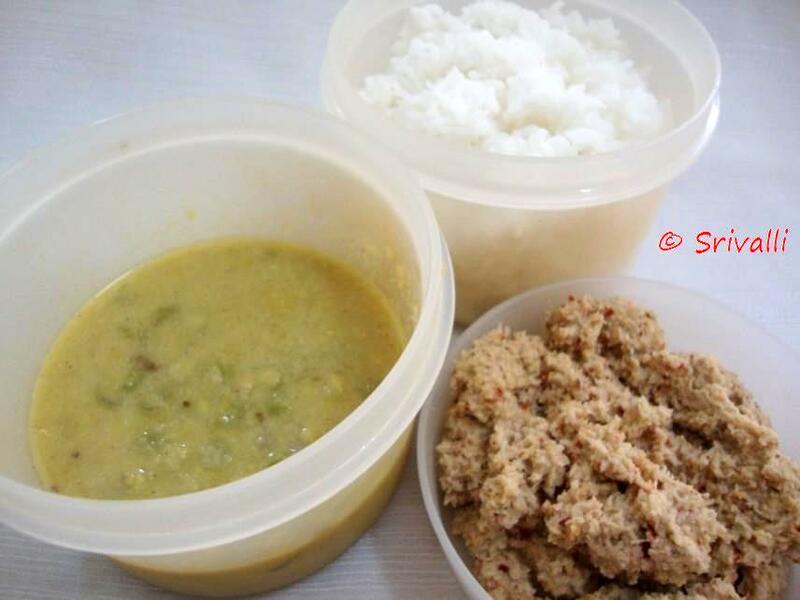 This is similar to the kootu that is made in Tamil Nadu except I never knew if one adds Urad dal to it. But on the hole a wholesome meal in making! Love this combination. 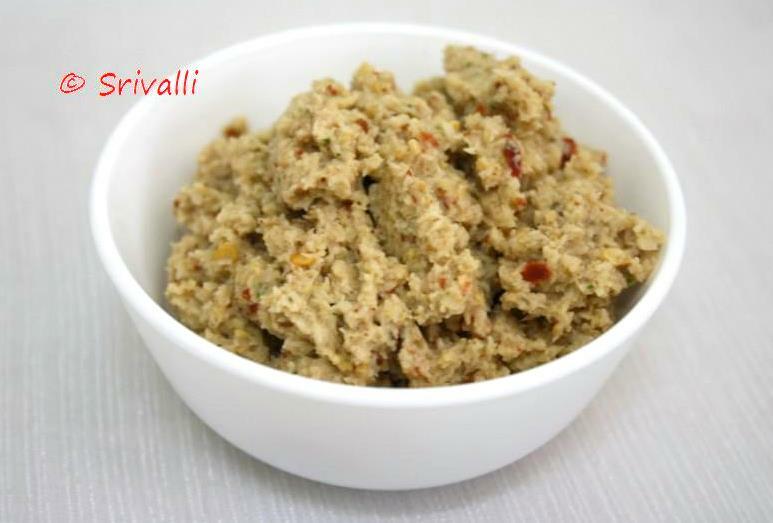 This mulagootal can be prepared with pusinika,podalanga etc etc. Very healthy and tasty too. Ideal combo is thogaiyal. Urs look very tasty and the click says it all. A healthy and scrumptious lunch menu Srivalli. Wish I was invited to your house for the same. Thganks for cooking from my blog.